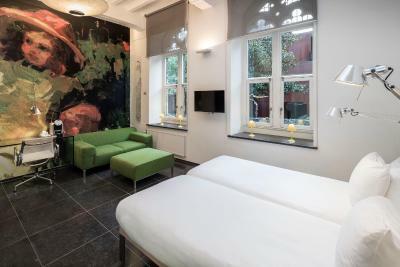 Lock in a great price for Kruisherenhotel Maastricht – rated 8.6 by recent guests! 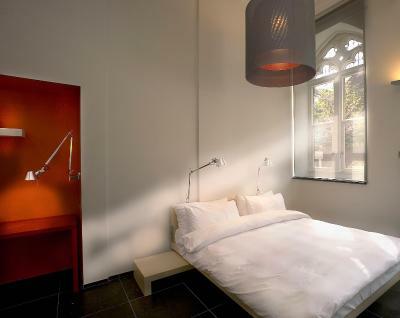 It as amazing to sleep in a monastery. The service was out of this world, they just wanted to please us in any way they could. Because of the location, being to close to the middle of town it added to our experience. Hope to be able to visit it again in the future, it is the best!!! This is a beautiful, historic property. The courtyard is beautiful. The service is great. Very eager to help with anything with a smile. I loved the interior. Breakfast was really good, with the real coffee, refilled unlimited, and best croissants! The toiletries are from Malin & Goetz which is a nice treat. It was great to be able to take a bath. Gorgeous facility and comfortable beds and obviously great location. Service at front desk wonderful. Porters and valets extremely prompt and helpful. A unique property with excellent food and service. 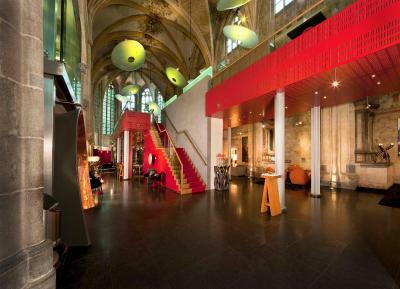 The hotel is a restored church! Not so sure if good for young children. 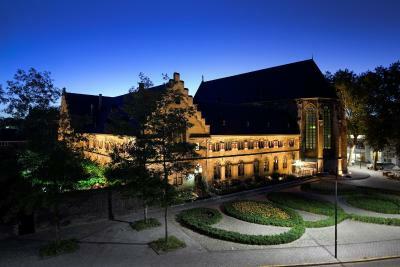 This is one of the more expensive hotels, but location of city was important to us. 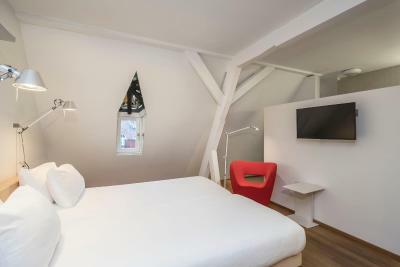 Wonderful location, awesome design of the interior, the room as also very cozy with everything we needed, staff was friendly and helpful. 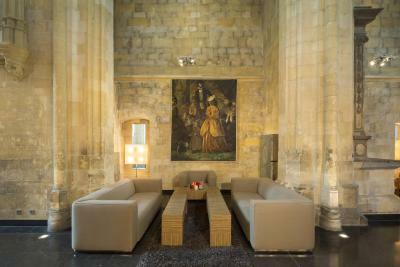 The hotel offers a unique opportunity to stay, dine and relax in a beautifully restored 15th century monastery. 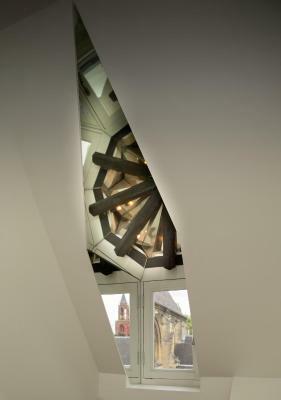 The contemporary design features, furnishings and artwork offer a compelling contrast to the historic church architecture. The restaurant used for breakfast lunch and dinner is set on a second story platform in the main hall of the monastery, offering a unique dining experience. The staff are all welcoming, friendly and helpful providing great tips to area sights. Breakfast was very good offering a wide choice of foods and beverage. Room faced the central courtyard was large, quiet and clean. Great location for city walks in this wonderful city. Fortunately we obtained a reservation for an exquisite dinner at the hotel restaurant, a wonderfully prepared and presented fixed menu dinner experience featuring regional and local foods and wine. 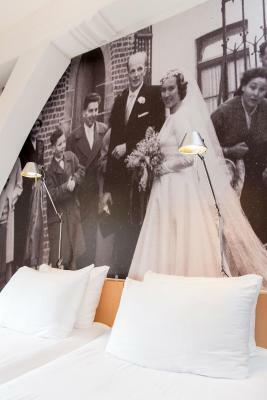 Our stay at Kruisherenhotel was the highlight accommodation of our 15-day Netherlands and Belgium travels. Kruisherenhotel Maastricht This rating is a reflection of how the property compares to the industry standard when it comes to price, facilities and services available. It's based on a self-evaluation by the property. Use this rating to help choose your stay! 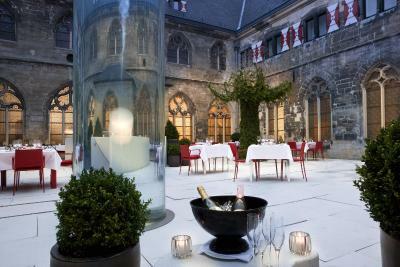 Set in a renovated Gothic monastery, Kruisherenhotel Maastricht has free WiFi and combines the medieval outside with a wide range of spectacular designer furnishings in the inside. 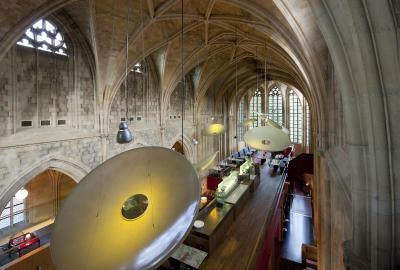 It has a mezzanine level restaurant in the central church hall. 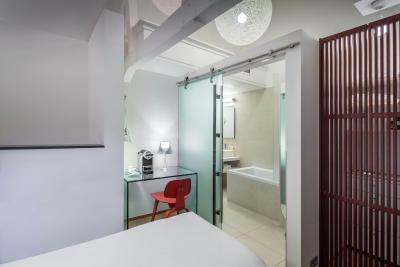 All rooms include air-conditioning and a luxury bathroom. 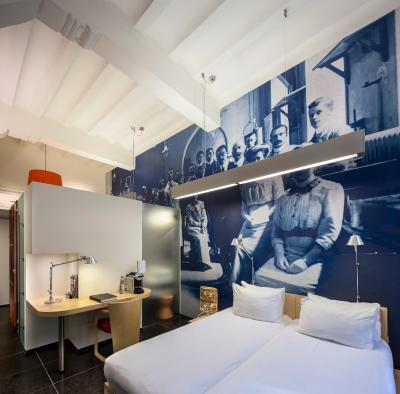 Each room, with art work and a personal poem, has its own individual contemporary character designed by international designers (such as: Philip Starck, Le Corbusier and Ingo Maurer). 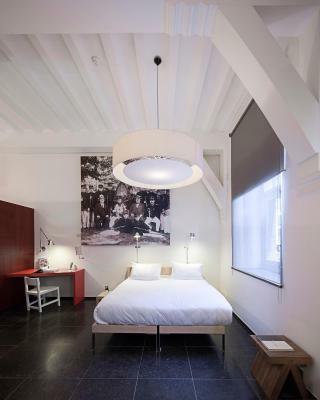 The beds are custom-made by Henk Vos and Auping. 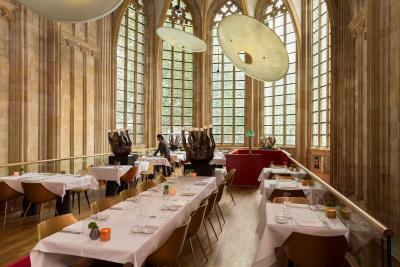 Located on a mezzanine, the restaurant at Kruisherenhotel gives the guests a closer look of the wall and ceiling decorations. It offers multiple course-dinner, light lunches and breakfast in the morning. 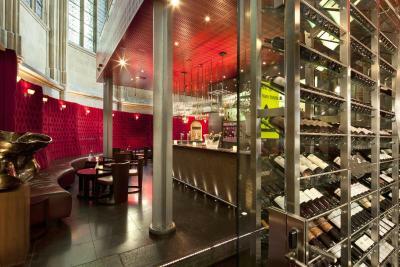 At Wine Bar Rouge & Blanc, guests can choose a wine from the large collection, showcased in a glass wine cellar. But just a cup coffee with “Limburgse Vlaai” (sweet vlan) is also available. 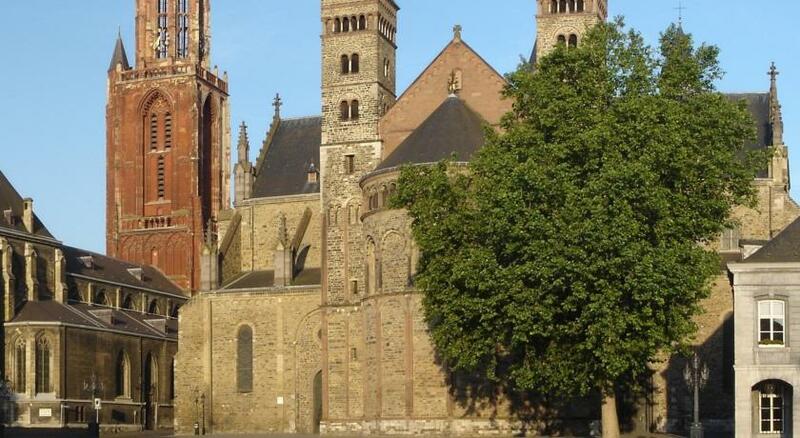 Sights at in the historic Maastricht city center are within 5 minutes on foot, Vrijthof square is 1,650 feet away. 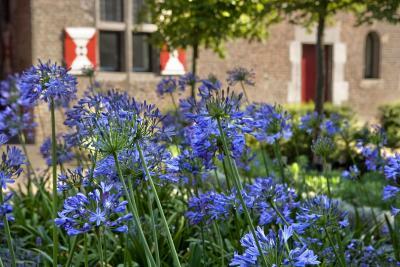 Kommelkwartier is a great choice for travelers interested in clothes shopping, gourmet food and old-town exploration. 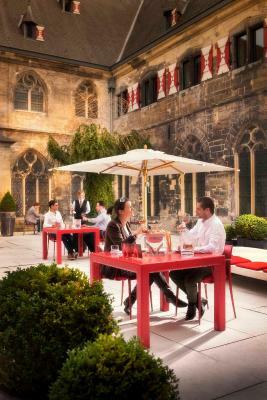 When would you like to stay at Kruisherenhotel Maastricht? 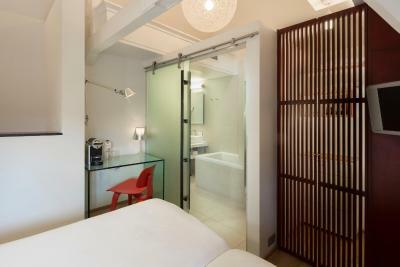 This room features air conditioning and a luxury bathroom with bathtub. 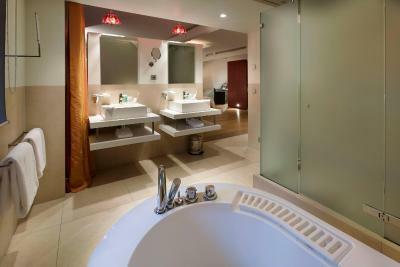 This room features a king bed, air conditioning and a luxury bathroom with a bathtub and separate shower. 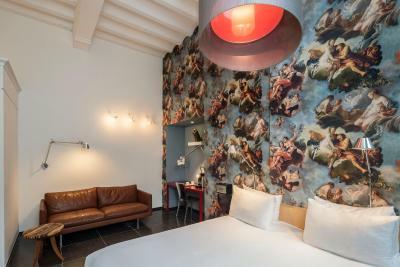 Please note that it is possible to request an extra bed for this room type. Extra charges may apply. 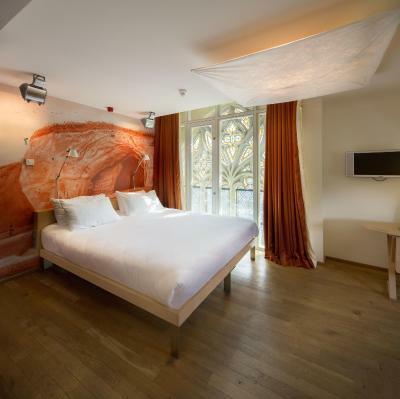 This suite features a king bed, air conditioning and a luxury bathroom with a spa tub and a shower for 2 people, Zeppelin Air and free Wi-Fi. 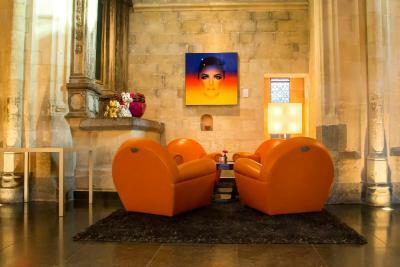 Dating back to the 15th century, the former Kruisheren monastery and adjoining Gothic church have been transformed into a spectacular design hotel, located in the heart of Maastricht’s historic centre. 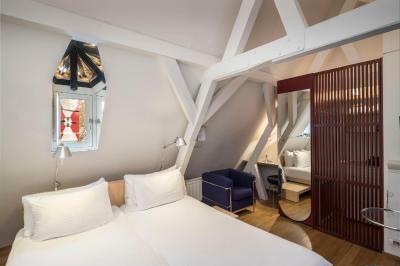 A member of Design Hotels™, Kruisherenhotel Maastricht combines thought-provoking architecture with original features throughout the 60 ultra-modern guestrooms, each with their own individual quirks and details. 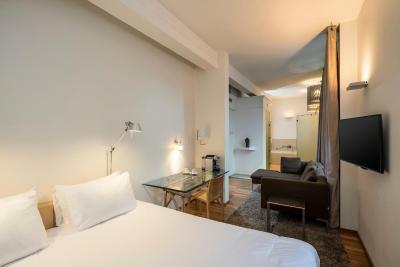 Hotel surroundings – This neighborhood is a great choice for travelers interested in clothes shopping, gourmet food and old-town exploration – Check location Excellent location – show map Guests loved walking around the neighborhood! 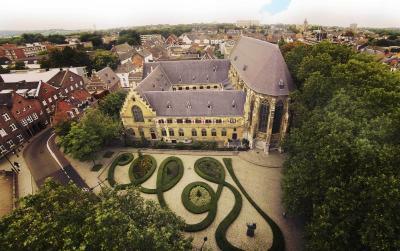 House Rules Kruisherenhotel Maastricht takes special requests – add in the next step! 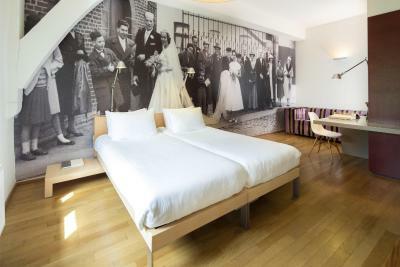 All children from 4 to 11 year are charged EUR 25 per person per night for extra beds. 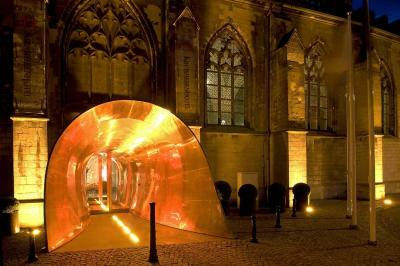 ATM card Kruisherenhotel Maastricht accepts these cards and reserves the right to temporarily hold an amount prior to arrival. 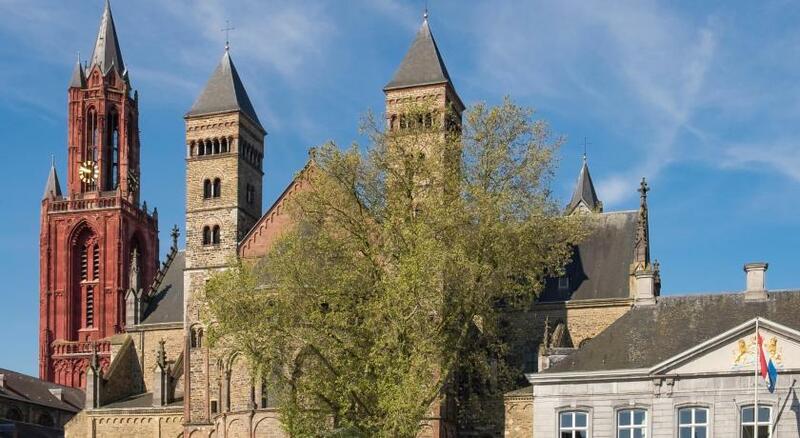 Kruisherenhotel Maastricht accepts these cards and reserves the right to temporarily hold an amount prior to arrival. Please note that children in the age of 4 until 12 years old can enjoy breakfast against a surcharge of EUR 12.50. Children in the age of 13 years and older pay a surcharge of EUR 21.75 for breakfast. Dining room chairs by designer. Look ok but totally uncomfortable plastic chairs. You slide around and if you are more than 150 lbs the sides don’t fit and actually hurt. 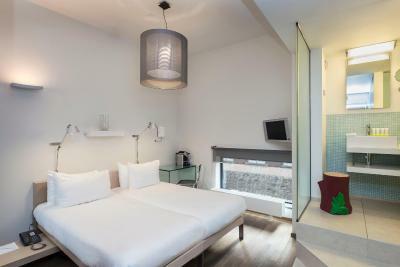 THE ROOMS, very small (understandable) however design, lay out totally impractical terrible design. Doors blocking the way in the room. Tiny bathroom sink. No place to put anything. Hotel may be 5 * The rooms are at best 3 star. Excellent courteous staff. Dinner dining is 5 star cooking. 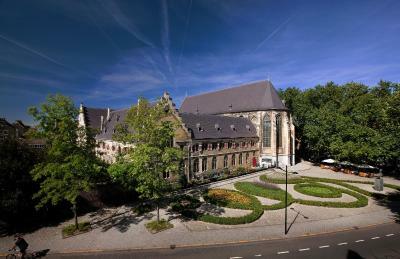 Very nice beautiful historic church building. Breakfast OK, all eggs boiled Rockband. Omelet overcooked. Other selections OK, similar to other hotels. Beds are comfortable. No sport facilities. Room (shower / bath and bed) not clean enough. Nice spacious room. Good location; spectacular design; very friendly staff. Scenery, friendliness of staff, quality of the breakfast, location. I had expected room in The main building. 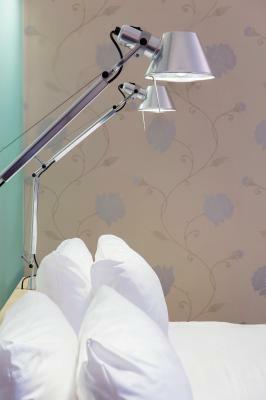 Bedside tables need to be higher, they are almost at the floor level. 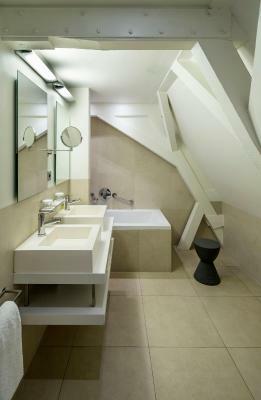 No counter space in the bathroom -- while the design looks interesting, it is impractical. Nice to have a wall mounted magnifying mirror, but without an adjustable height, its benefit is lost on those who don't have the Dutch height gene. Bold. Dramatic. Clever. 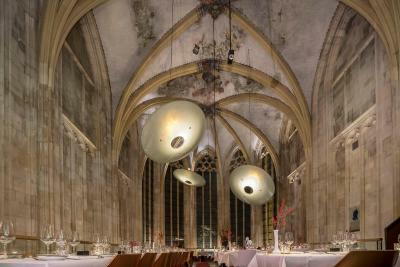 Phenomenal execution of modern design elements installed within the preserved Gothic monastery deliver surprise and unexpected delight. The public spaces are punctuated by coves of comfort ideal for convening and for admiring the soaring scale of the original building as well as observing the boldness of the new design elements. Staff are even more brilliant than the architecture and design. Welcoming, helpful, friendly, attentive. 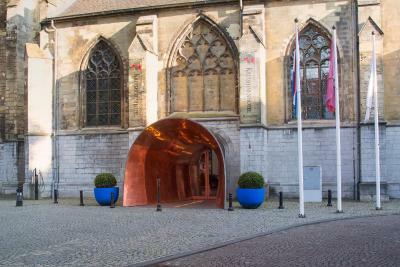 Attention to every detail that begins at the unique and unforgettable copper entrance (a design detail that has been cleverly replicated in the presentation of the dining bill) and carried throughout the property and service. Each room has a unique interior and character but all with comfortable amenities (radiant heated floors, comfortable bedding and linens, deep soaking tub). 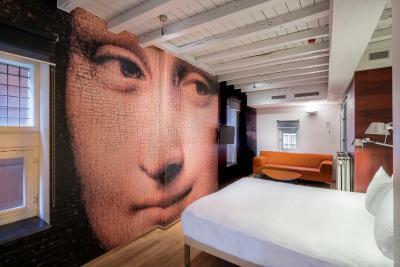 For 300euro/night I would expect the staff to be more helpful and friendly. 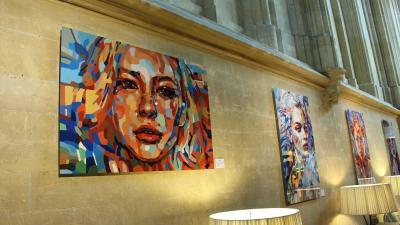 Great location in a renovated church. Fantastic ambiance. 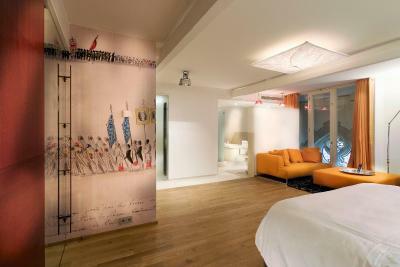 We stayed for one night and, although we were satisfied with our stay, it is quite expensive. Also, our bathroom had 2 sinks, yet the toilet was in a seperate room with no sink. Great location and super friendly staff!!! So much love for detail - from all the carefully decorated shared areas to the items in the rooms, plus we even got a little present as it was my mom’s birthday surprise to stay here. Would totally recommend this place! 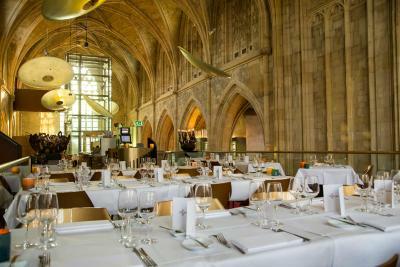 The architecture is wonderful, the lunch was outstanding along with the overall atmosphere. Staff were attentive and everything was enjoyable. Toilet was separate from rest of the bathroom and located by the front door, with no sink to wash hands. The staff was very helpful and the building was spectacular. For the price, it's not worth the stay. 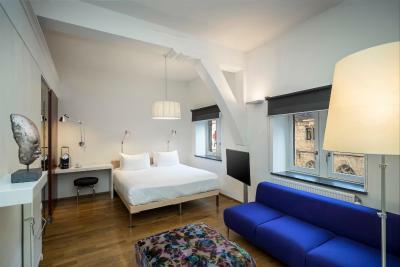 were given a deluxe room above a cellar with machinery making a terrible ressonance which made my ears ache. After complaining were given another room. This room was so small where you could hardly move. Not a deluxe room!! This hotel is far too expensive !!!!! !